We’d love your help. Let us know what’s wrong with this preview of Iron Circle by Justin Joschko. The path west is long, but despite Selena’s progress, New Canaan is never far enough behind her. It was there that her parents were killed, forcing her and her little brother Simon to flee the tyrannical state. Now, New Canaan wants control over every last inch of America-That-Was. Only the Republic of California can stand against it—but not without the data stick in Selen The path west is long, but despite Selena’s progress, New Canaan is never far enough behind her. It was there that her parents were killed, forcing her and her little brother Simon to flee the tyrannical state. Now, New Canaan wants control over every last inch of America-That-Was. Only the Republic of California can stand against it—but not without the data stick in Selena’s pocket, rumored to contain vital information about New Canaan’s deadly new weapon. 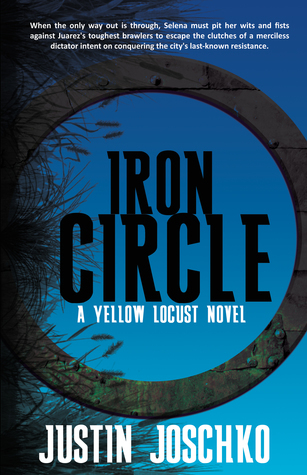 To ask other readers questions about Iron Circle, please sign up. Simon, Marcus, and Selena are separated in this one. Each have their own dilemmas to deal with until they reunite in the end. Each have tough decisions to make and although they don't always make the right ones they continue to work towards getting the info they carry to the right place. A lot of action in this one. I honestly almost teetered on giving this 2 stars, which I’ve only ever done a handful of times. There’s a lot of problems in this book that have nothing to do with the plot. However, the plot itself isn’t very interesting either. Selena and her brother Simon are separated, and they still have a very important job to do. While the circumstances of their separation are the entire book’s premise, the plot is slow moving. Lots is being said, but not a lot is being done. Things just aren’t moving for I honestly almost teetered on giving this 2 stars, which I’ve only ever done a handful of times. There’s a lot of problems in this book that have nothing to do with the plot. However, the plot itself isn’t very interesting either. Selena and her brother Simon are separated, and they still have a very important job to do. While the circumstances of their separation are the entire book’s premise, the plot is slow moving. Lots is being said, but not a lot is being done. Things just aren’t moving forward very quickly. I expected more action, more movement. More important things to happen. Hardly any mentions of the events of the first book. It’s almost like the first book never happened and didn’t matter. Same characters, but no tie ins. If this was the first book in the series, you wouldn’t be lost at all. Along with that, the lack of character development in this book is discouraging as well. No one makes any real headway on growing. Violence is always the answer and no one learns any lessons because there aren’t any lessons to learn from. Secondly, while the book was slow moving, there was no short of sexualization of women and showcasing of violence against them. While not showing people being outright sexual, the continual descriptions of women in sexual manners while describing men as “having tattoos” and the manner of their hair is something that definitely is not going to draw back in. I almost stopped reading this less than halfway through because of the repeated descriptions of it. Another thing that needs to be reviewed is the slavery in the book. There is an actual slave trade going on here, and at one point, Selena is involved in it as well in a different, less obvious way, and she says she’s in a “caste system”. That felt insanely disrespectful and dismissive and I think it needs to be reviewed further. Finally, I would be remiss not to discuss the author’s repeated phrases and continual verbose language throughout the book. Whenever he says someone smiles, he describes their teeth directly afterward. There are several words he uses REPEATEDLY throughout the book instead of using other words or phrases to describe something, which gets tiring and frustrating to read. It’s not encouraging me to read the series further if I’m going to get the same descriptions and unapproachable language in several sections. This is a YA book, and while I’m not expecting the language to be dumbed down, I’m also expecting it to be approachable and easier to read for people, and younger audiences. Overall, my impressions of this book weren’t outstanding.